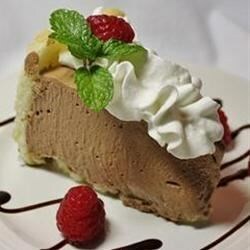 "A rich, delicious, and relatively easy chocolate mousse cake. If lady fingers are unavailable, use slices of sponge cake. This recipe contains raw eggs. We recommend that pregnant women, young children, the elderly and the infirm do not consume raw eggs." Line bottom and sides of a 9 inch springform pan with ladyfingers. In the top of a double boiler over hot water, melt the chocolate chips, stirring frequently. When the chocolate has melted, mix in the 2 eggs thoroughly. In a large bowl, whip the cream until it is thick. In a separate large bowl, with a clean whisk, whip the whites until stiff but not blocky. Add 1/3 of the whipped egg whites to the melted chocolate and fold in. Quickly add this to remaining whites and fold in. Fold in the whipped cream until no streaks remain, being careful not to overmix. Pour mousse into the cake-lined pan. Cover with plastic wrap and refrigerate for 4 hours. See how to make moist, rich chocolate cake. I should have cut the ladyfingers in half because the filling reached half the height of the cookies. I made this cake for Thanksgiving and it tasted like a piece of heaven!!! !